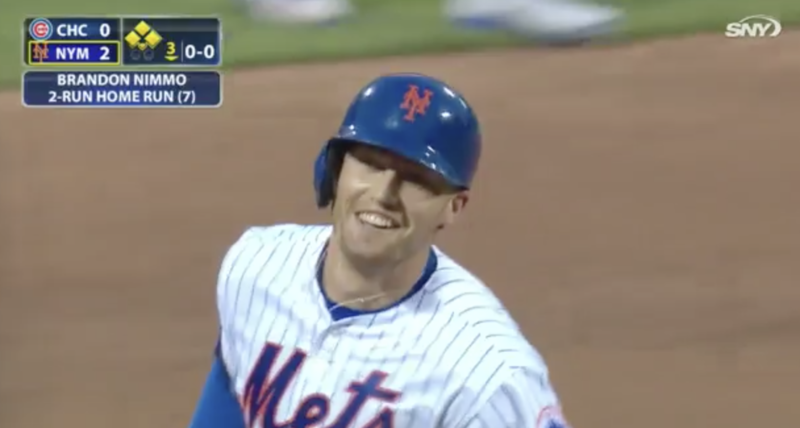 Brandon Nimmo’s promise as a hitter had been addressed in these pages during the offseason, so it’s not surprising that, when Nimmo was demoted to Triple-A following a strong start to his 2018 campaign, this author argued on behalf of a quick return to the majors. The decision had little to do with his talents, of course. Rather, it was due mostly to the outfield logjam created by the Mets after reuniting with Jay Bruce over the winter. Nimmo was quickly freed from Las Vegas in mid-April, however, returning just days after being demoted as the Mets moved Jacob Rhame to the DL. Since he’s returned, all he’s done is lead all NL batters in wRC+ (173), ranking third by that measure among all major leaguers with at least 100 plate appearances . Nimmo has, and continues to have, a curiously strong understanding of the strike zone and quality contact skills. His out-of-zone chase rate of 20.5% entering play Tuesday ranks above the 90th percentile of major-league hitters. His zone-contact rating of 85.6% is slightly above the MLB average of 85.2%. He’s always swung and missed at a single-digit clip. Those underlying skills support what has been the majors’ eighth-best walk rate of the last two seasons (15.2%), 11th-best on-base mark (.397), and 14th-best wRC+ (141) among batters who’ve recorded 300-plus plate appearances since the start of 2017. An elite eye and above-average contact skills typically portend offensive excellence, but now Nimmo is adding something else to his game: power. I’ve spoken with evaluators who believe it’s difficult to teach someone to hit, to improve bat-to-ball contact skills and quality barreling of pitches but that it is possible to teach, to increase, power. Perhaps that’s what we’re seeing with the evolution of Nimmo. Nimmo had never shown much power in the minor leagues. His top isolated-power mark at any level where he’d taken more than 50 at-bats came in 2016 at Triple-A (.189). He produced a small collection of sub-.100 marks, even. He was never a fly-ball hitter, producing more ground balls at every qualified stop. He was never a pull hitter, spraying the ball all over the field. Much of that has changed this year, however. 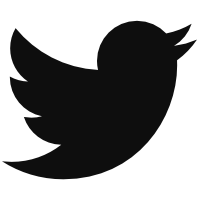 Let’s start with the nature of his ground vs. air distribution. 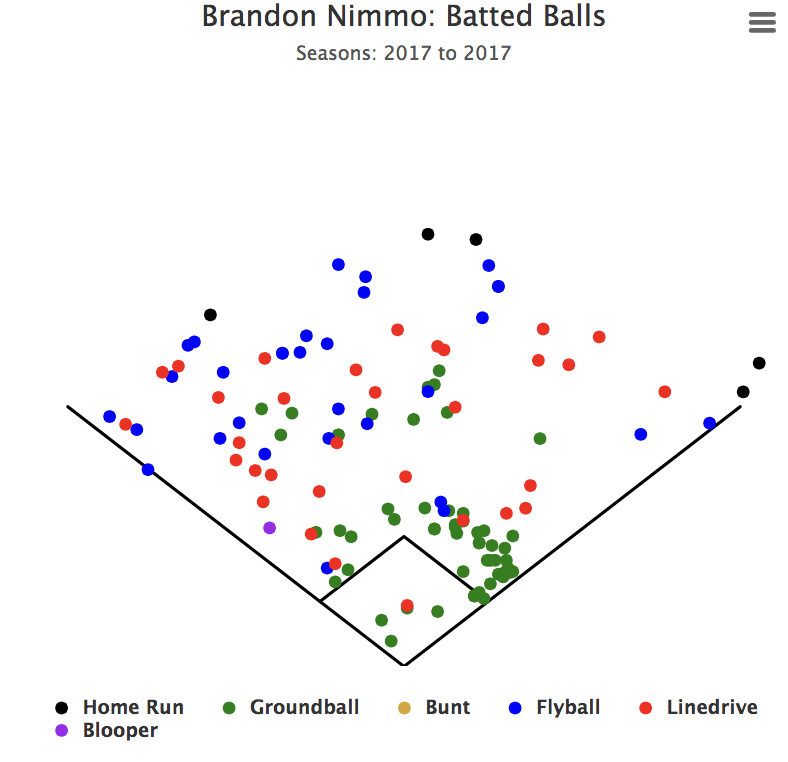 Nimmo has rarely hit the ball in the air with much frequency. He consistently recorded ground-ball rates around 50% in the minors. He posted a 42.9% ground-ball mark with the Mets last season and a 1.31 GB/FB ratio. This season? He has a just a 31.5% ground-ball rate and 0.65 GB/FB ratio. His average launch angle? It rests at 17.7 degrees, up from 9.6 last season. Overall, that’s quite a pivot. And it’s not just about north-south, batted-ball direction, but also that of east and west. 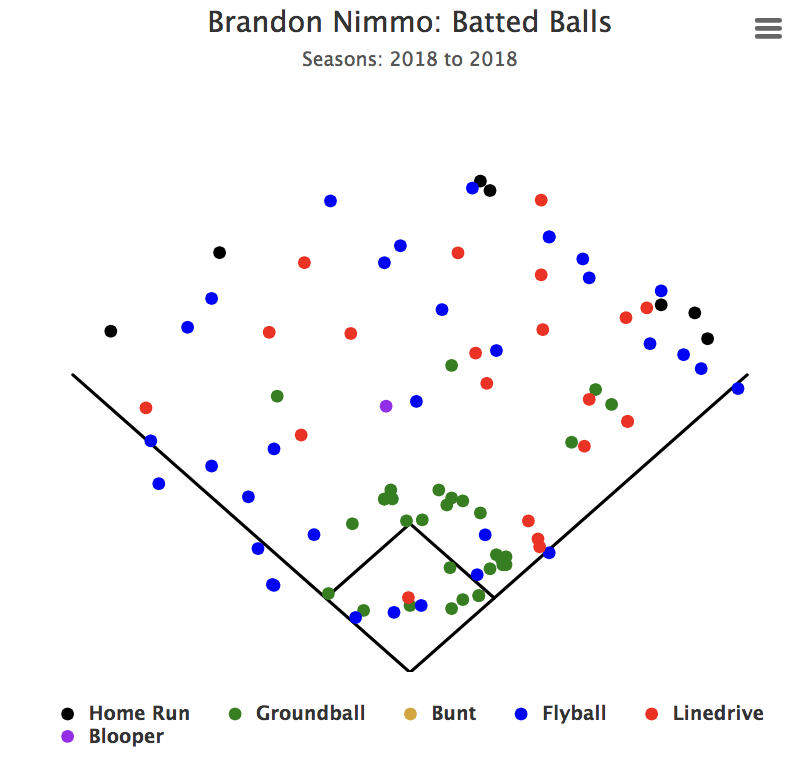 Nimmo ranks 25th in the majors air-ball pull percentage at 41%. Last season? He ranked 388th out of 415 hitters in pulling air balls (minimum 40 batted-ball events in the air). 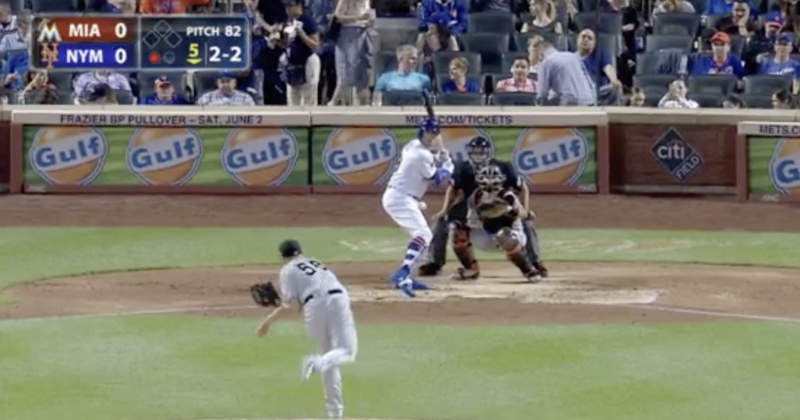 In 2017, many of Nimmo’s fly balls and line drives were directed to center and left. There’s a much greater concentration in right field this season. While not tremendously large samples, they certainly speak to what has happened, if not necessarily what will happen. Is there anything obvious that’s changed? At the moment, there are only theories. A second possible theory concerns pitch selection. Specifically, Nimmo seems to have concentrated a greater quantity of swings at pitches that, historically, he’s shown an ability to drive. 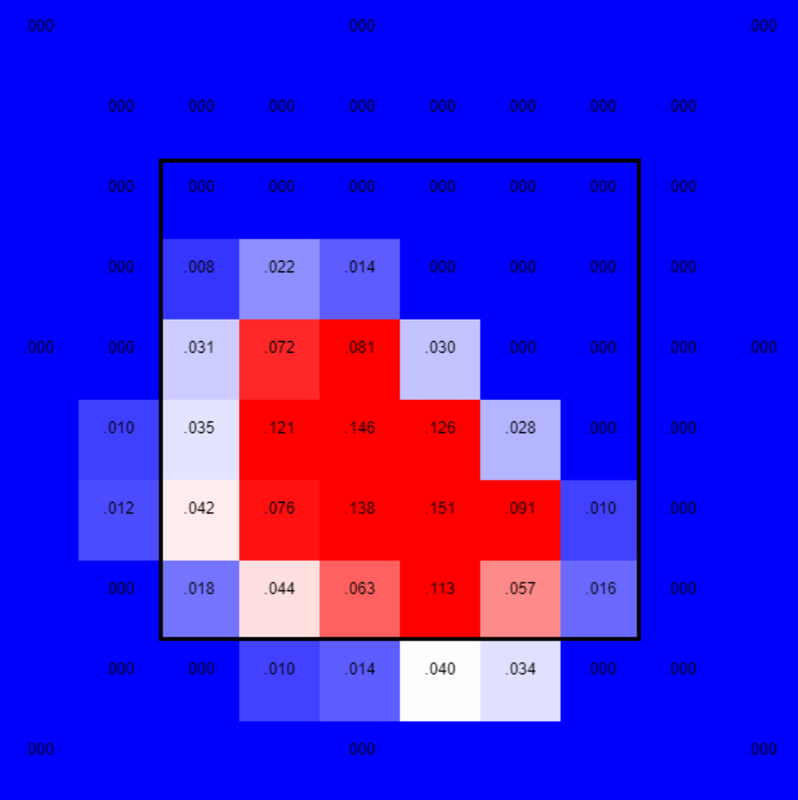 While the middle-out area of the plate has gotten a darker shade of red, Nimmo has dropped his swing rate on inside strikes by 20 percentage points. So what do we have? It appears we have an already good hitter who has become even better one, one who can do more damage to a pitch. We have a hitter with elite strike zone command and average to slightly above-average contact skills. We have a player who is now better able to damage pitches by lifting them into the air to his pull side. We have a player who already had the difficult-to-teach innate properties in place, and is now learning to hit for power. 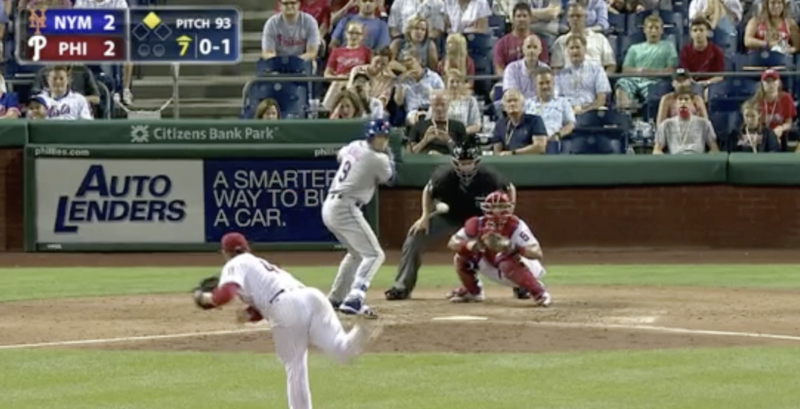 While we’ll have to see how the league punches back — he’s struggled against some offspeed and breaking pitches this season – what all these skills have added up to is one of the top offensive forces in the game. Whether the Mets break up some of their core this summer, or keep it all together, Nimmo is a piece to build around. We hoped you liked reading Nimmo Is Finding His Power by Travis Sawchik! And he’ll still manage to head to the bench when Cespedes comes back instead of figuring out something with Bruce/Gonzalez/Flores at first. Because…well, the Mets will have some stupid reason. I say this as a huge Mets fan. No need to get angry over something that hasn’t actually happened. 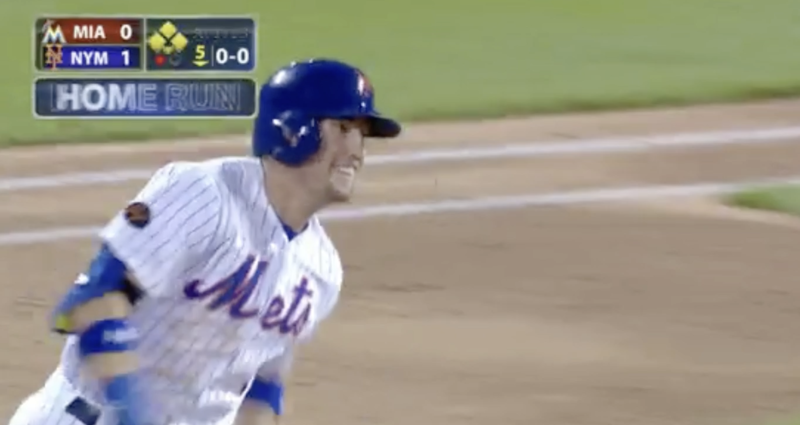 Nimmo’s already been declared the everyday leadoff hitter by Callaway. He’ll be happy to know also that Gonzalez was released and Lagares his unfortunately hurt, which lock Nimmo and his now-11 homers into the lineup. Vet retread Jose Bautista is a utility player with Jose Reyes.